On April 19th 1775, British troops marched out of Boston to seize any/all contraband arms in the community of Concord. To some today its British imperialism, the seizing of the peoples arms in preparation to dominate them. To others it was a legitimate action since the arms were obviously illegal. These two view points, expressed by the two factions in the gun control argument miss the real facts of the matter. The guns were not the peoples weapons since those arms were sitting within the homes of the people in that area. When the word came the British were marching, the men of Lexington didn’t march to Concord for the arms that they used on the Lexington Green. Nor did the other militia units go to Concord before setting up their attack on the British forces. It’s a little know fact today that after reaching Concord the British had a running fight all the way back to Boston. The British troops very likely would have been cut-off if they had not been reinforced by additional British troops sent from Boston. So what were the Concord arms; they were supplies the British government had learned about through spies. The continental Congress had sanctioned the formation of a separate government for Massachusetts, outside of Boston. Every community outside of this city was controlled by this shadow government and thus the British had declared the colony in Rebellion. And of course this shadow government had begun stockpiling arms and ammunition. The people were armed at their homes with the means to defend against an initial attack. The Arms the British were primarily after where cannon, reported by the spies. In point of fact there was no single arsenal or armory building to empty: the cannons were buried in a farmer's field, or in the basement of the local tavern. And the weapons the British found were in fact just those cannons that hadn't been removed the week prior at the warning of Patriot spies within Boston. So the arms were not those of the individual citizens of the general area. The cannons that were found were too large for use in defending the community, but were intended to attack fortresses. Its true that the action set off the revolution, but only because American militiamen and British troops exchanged fire over essentially nothing. The British barely found anything to destroy or remove, and the militia was truly not defending anything that hadn't already been removed. Its history that has been changed to match the views of people decades and even a century later. The point in all this, we don’t understand the history of how we have defended our selves or our community since its inception. Worse, even those nations we call Allies don’t understand how things actually work. And, as a result, they get themselves in situations were they can’t defend themselves without literally surrendering to someone else. This is the real problem of gun control, the creating of an unworkable system of defense while claiming that nothing has gone wrong. It only is found to have gone wrong when the war finally begins: at which time its too late to do anything. After the revolution early gun control laws could cause serious problems. The government tried to create a consolidated national militia that would be able to work with federal troops. But the States had their own ideas as to what was needed or not. The federal regulation know as the 1792 Militia Act had a required arm of a specific caliber to be owned by the men of the militia. But the arm was decided on based on the arm the Army was using at the end of the revolution (French Charleville Muskets). Wonderful idea if one didn’t mind a gun best suited for the forests and mountains in New England. But in the southern States a short musket, called a Fusee, was the preferred arm of farmers and hunters. Further west, in Tennessee or Kentucky, the rifled musket was the preferred arm. Even in New England, many men owned a British Brown Bess since until the 1792 Militia Act it was the arm they were required to own for British militia service. Thus in Federal returns of the period before the War of 1812 muskets (both Brown Bess and Charleville) would dominate the militia in New England, Fusees would be the major arm in the south, and in the west would be rifles. To stimulate internal arms production in the 1790s a tariff was placed on imported arms to protect American arms makers. Prior to the revolution, to buy a military grade weapon required you to buy arms from a select group of manufacturers in England. The tariff was to even the playing field for American makers who were now able to bid on contracts to arm both the new state forces, and the American army. The tariff however was just the start of Congressional action to facilitate the arming of the nation. In 1798 another law was passed in which the government would ship the arms to these citizens and then take payment in the form of raw materials- hides, furs, wood, cotton, etc. This was to help Americans who didn’t live in New England get the gun the Federal government required them to have. But as noted, people didn’t want that gun. They wanted an arm they could use on their farm or for hunting to acquire furs, hides or food for the table. The Federal arm was only useful in New England and thus was an impediment anywhere else. Worse, the government, to make money for its own debt, was selling off British and German guns seized in the revolution to civilians. This took money out of peoples’ hands and thus less money to buy new arms from American gun makers. Thus for gun makers who wanted to make what the people wanted, the Federal style arm was a distraction that could even cost the maker money. Of course it didn’t help that American gun makers, for the first time, had to make arms to Federal specs. Again, prior to the revolution, all military grade arms were made by a specific group of makers based in England. That list, as well as what they made, was controlled by the Board of Ordnance created by Parliament in 1670. When American makers made guns under British rule, they were not expected to make high quality arms, just good enough for colonials. Now these manufacturers were being held to higher standards and Federal inspectors rejected many arms built to fill these Federal orders. The gun makers then sold these rejected arms to who ever they could to get back some of their investment. This in turn depressed prices and got Federal attention. Representatives in congress would then accused the gun makers of charging the government excessive prices for their arms compared to private sales. The wonderful world of change. Was this only an American experience? Across the ocean in Britain a serious conflict had been raging for a decade. Called today the Napoleonic wars, Britain suddenly had to acquire arms in a very short period of time. The previous French and Indian war in North America, or even the American Revolution, was nothing to the scope of the problem Napoleon and the French Revolution started in Europe. Under British law, implemented in 1670 private citizens were forbidden to own arms. It was invested to members of the House of Lords, who were expected to arm men in their community at the request of the king. The story of sons of Lords who had a commission before they could shave was a fact in Britain at this time and for the next 100 years. It was also a fact that many Lords would decorate the walls of their homes with the arms they kept to equip troops when requested. Otherwise, the 1670 law created a huge stockpile of 200,000 arms at the Tower of London. Of course when the American Revolution began this armament system failed. Britain lost all its prepositioned supplies in North America and even the loss of the arsenals at frontier Forts such as Ticonderoga. To put down the rebellion Britain raised a regular Army force nearly as large as the combined Army/militia force of the French and Indian war, plus supported nearly 20,000-loyalist militia. But where did the arms come from: Lords in England could hardly be asked to turn over their arms to equip British units heading overseas. This left the arms in the Tower, which were only 200,000 as per its creation: Thus equipping the expanded forces required a minimum of ¼ of the Tower stockpile. For Britain, the use of 30,000 Hessians was cheap since they came fully equipped and if they died, or where captured, they were already paid for. The point, it wasn’t the lost of troops at both Saratoga and Yorktown that hurt England, it was the loss of over 15,000 arms. Britain was bleeding arms more then men during the Revolution: Arms it couldn’t replace as quickly as they could the men. To get an idea of the losses, a US Federal report in 1811 on Federal arms indicated that the United States army still had a minimum of 65,000 stands of arms that were either of British or German caliber in Federal store. And this was after a decade of Post-Revolution sales of surplus arms to American citizens. Following the Revolution the British Army continued to decline in strength until it was only 40,000 men by 1790. This reduction in troops, plus the loss of the North American market forced the approved British gun makers to change their manufacturing style. Where before they held a stranglehold on military arms for America and Britain, they now had to start making other (lower quality) guns. Arms for the slave trade now took precedence, as did Trade guns for sale in British Canada and the short India Pattern musket for colonial troops in India. When the Napoleonic wars began a massive expansion of both British troops and arms began. By 1813 the British Army had risen to a huge 250,000 men. In the same regard gun manufacturing had to increase to where 1.8 million arms were built in Birmingham England alone- more then 2/3 of all English arms production at the time. They were all the India Pattern Brown Bess musket since it was the gun in production when the conflict began. And the small list of contractors now equaled 4,000. Did all these arms stay in England: Absolutely not. Since the original pattern for the arms was set to equip colonial troops in Egypt, India, and Australia, the guns were also exported to these parts of Britain’s empire. India Pattern Brown Bess muskets were sent to arm troops in Canada to defend it against American troops during the war of 1812. More importantly, in 1803 a ceasefire in the Napoleonic war caused many of the combatants to sell off their used arms. Thus British and French muskets, at bargain prices, showed up on American docks for public sale. This prompted an effort in Congress to suspend the previously mentioned tariff to assist the arming of the American militiamen. Back in American, it had taken two decades, but by the start of the war of 1812 the Nation had some 200,000 muskets for the Federal Army, 130,000 of them the “right” French pattern and caliber. It also reported that the militia had some 380,000 muskets, rifles, fusees, and pistols. The Federal supplies were to arm some 40,000 troops. The militia arms were to equip 600,000 registered men. Some would say that the militia was only half armed so it indicates the militia was useless. What most historians miss however is that the Springfield and Harpers Ferry arsenals barely produced 130,000 arms over 15 years. The remaining 70,000 Federal arms can be attributed to arms seized in the Revolution, but that leaves the 380,000 arms of the militia having to have come from civilian makers. With the exception of 1803, imports were impossible due to the Napoleonic wars and then the self-imposed embargo act. So these 380,000 arms had to be made internally and they had to be made by independent contractors. The point being made here is that prior to the advent of interchangeable parts, in a time when guns were mostly hand made, between England and the United States there were enough gun makers to produce close to 140,000 military grade arms per year. And Napoleon’s empire was equally good at making guns. The Charleville model 1777, modified by Napoleon himself in 1800, was built to the astonishing number of 7 million examples until 1839. That would be 110,000 per year for France only. What happened to all these guns after the Napoleonic wars ended. They went to Spain to rebuild that countries military after the Pennisula war. They went to Mexico and other new Spanish nations after their revolution from Spain. But more importantly they went to colonies of France, and England, and they went to America to arm Americans moving westward. Over 150 years later they have been found in caches in Middle-eastern and Asian palaces. Now as previously noted, the Tower of London contained 200,000 guns as a national reserve. In 1841 a fire broke out in the Great Armory destroying everything within. Think about it, in one single event a minimum of ¼ of the British military stockpile, possibly more, was obliterated. Granted the guns were old Brown Bess Muskets, but to restore the short fall the British government restarted Brown Bess production (updated to use percussion caps). They had a new musket already in production, but it couldn’t be made fast enough to meet the emergency need. And England hadn't learned that restriction and control could lead to its military suddenly having to scrounge for basic arms. In a similar manner, in 1801 the City of Washington passed a law to prohibit the firing of guns within the city. Some would view this as no different then modern laws prohibiting the firing of guns. But modern laws take into account the issue of self-defense and exempts military and Police. The Washington D.C. law however seems to have had no limit and was even applied to the city militia during its federally required muster. Long story short a law which the City will never claim was to hurt its own militia was soon forcing the men to attend muster carrying corn stalks, brooms, or lumber instead of their required arms. By the middle of the 19th century gun-prohibitions were becoming standard for “western” nations. Primarily in major cities, but people in general were being pushed to not own and or practice with firearms. In England this created a unique situation where the government could find huge numbers of men who were skilled in the Medieval Long Bow, while a basic knowledge of long guns was becoming more and more a skill of only British Lords and or their game wardens. in America the abandonment of the common militia system in 1840 in favor of volunteer militia created a similar situation along the Eastern coast. By the time of the Civil War most new England males had no idea how to even operate the arms of their patriot forbearers. As for the volunteer militias, who in many cases were private forces operated by rich men within the community (shades of the British lord system); These forces many have been cheap to operate, and not have the old militia system political baggage, but when the Civil War began these volunteers were more parade troops then anything else. During the Civil War both sides hammered the central States for men. The reason, because these less developed, more rural, states had men who knew how to operate a firearm from the moment they were recruited. Following the war, General Burnside hoped to change this situation by the creation of the National Rifle Association. But when the Spanish American war began a pacifist Governor in New York essentially drove the group out of the State to New Jersey in a protest of that war. 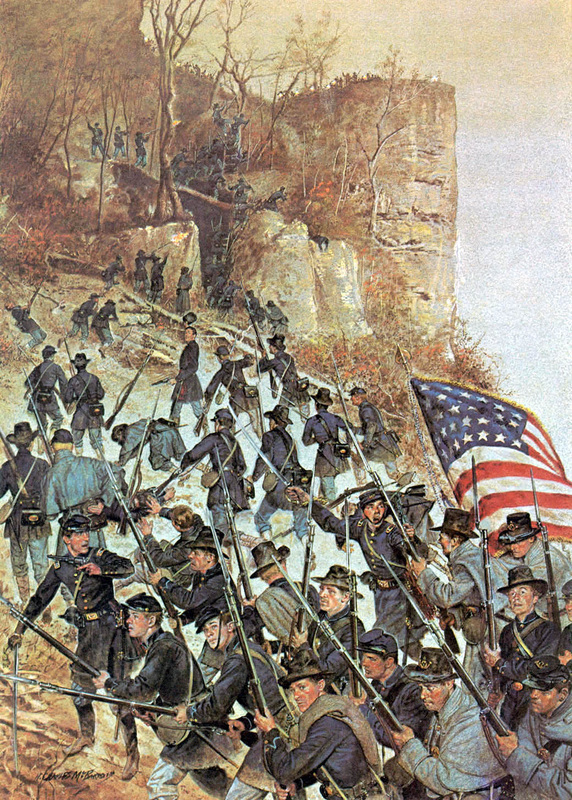 The Spanish American war then added evidence to the problem Burnside saw during the Civil War. The legendary unit of the Spanish/American conflict, the Rough Riders, was made up of wealthy men who could afford to shoot on their personal estates, or actual cowboys who still lived by the gun in the rural areas of the western United States. One would think European leaders would have noted the effect of no firearm training on Americas male population and work to prevent the same in their own nations. Instead, all Europe saw was the virtue of small, highly professional troops. 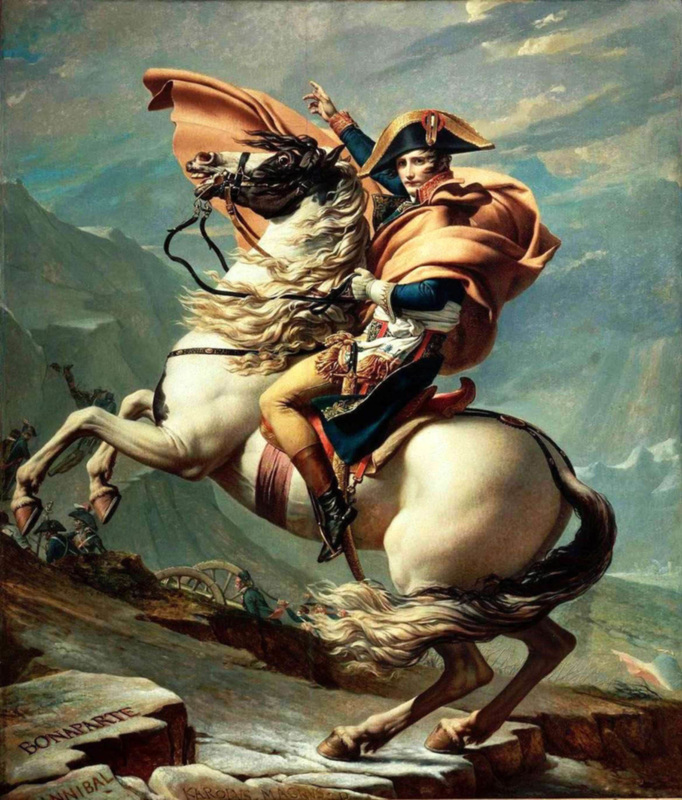 In the decades following Napoleon, Europe may seem to have been in a period of peace and art, but the truth was the conflicts were still there. Rebellions in Canada, India, Asia, and finally the Sudan kept England’s attention through most of the 1800s. After helping England defeat Russia in the Crimea in 1856, France just had to invade Mexico in 1861, only possible because America was tearing itself apart in its Civil War. After loosing to Mexican forces in 1867, France chooses to then provoke Prussia starting the Franco Prussian war in 1870. Spain also fought to maintain what was left of its empire. But in most cases these wars were insignificant in size compared to the forces Napoleon raised in the early 1800s. 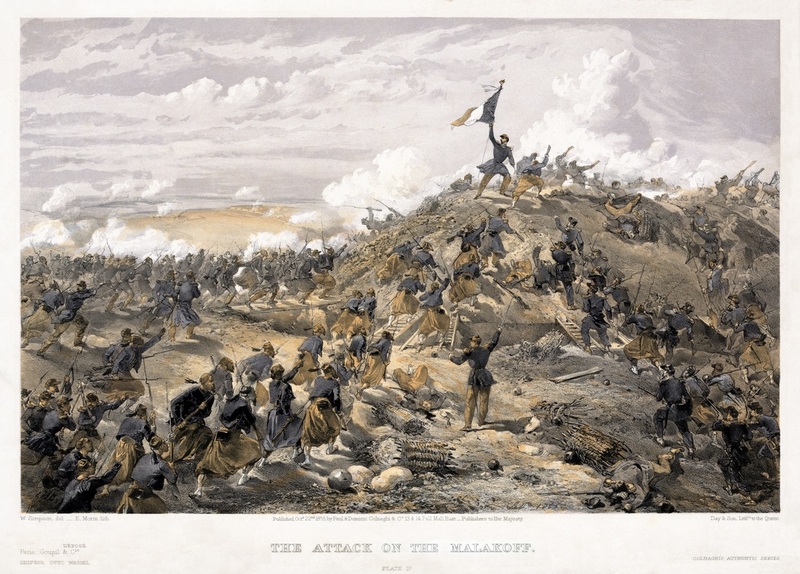 Only America’s Civil War comes close to the size of the Napoleonic armies and battles. This being said, why would anyone tolerate having a huge stockpile of obsolete arms: It turns the armory into a museum or the home of a Lord. By the time of the American Civil War, weapon advancement in Europe had made most of the arms in storage horribly obsolete. Thus when the American North came to Europe to buy guns the European nations were happy to offer their old muskets at full price. Thus making room in German armories for Dreyse Needle Guns (early bolt actions) or in England for newer rifled muskets. Before the century ended advancements like the lever action, the Martini-Henry breechloader, and even the Springfield trapdoor design were quickly superceded by the bolt action rifle and smokeless ammunition. In many ways no one expected that war to go more then a few months, a year at the outside. The previous conflicts, including the Franco-Prussian war had been very limited conflicts of short duration. The destruction that soon was occurring had not been seen since the American Civil War, and not in Europe since Napoleon. As a result Britain and its small, professional, army was taken by surprise. By the start of the war England, France and Germany had some of the most modern armies in the world. Unlike the previous century where civilian arms were universally more modern, the European nations had finally caught up. But where the weapons were advanced the tactics were practically 17th century. Cavalry still was to hurtle themselves across open land against enemy troops. Artillery softened the position but then stopped as troops advanced. And the troops practically walked across the fields, bayonets attached. They were slaughtered in a manner people wouldn’t allow done to cattle. The facts of the American Civil War and several earlier (small) European conflicts completely lost on the commanders on both sides. Troops began digging holes for protection and siege lines not seen since the Peninsula war were forming all along Northern France. The French Army, one of the largest at the start of the war, suffered tremendous casualties. Britain, with one of the smallest Armies in Europe at the start of the War had also an all-volunteer army. 400,000 strong, but only some 85,000 officers and men could be immediately sent to France: most being killed halting the German advance into Belgium. As England comprehended that 1/10th of its Army was dead or wounded, two changes were immediately implemented. The first was a call for troops from Canada and from Australia. The second was a conversion to conscription. And where was Britain to get the arms for these new troops, Canada and Australia was ordered to supply both armed troops and to supply arms for Britain to use to arm its conscripts. Britain saw Canada and Australia as an emergency stash; with no greater duty then to fight for King and mother country. The problem of course was these two countries, still under the requirements of the 1670 act, were buying all their military arms through the same British contractors as Parliament. The creation of the Royal Small Arms facility in 1816 had only made the production more consolidated. And England kept it that way, in that when Canada tried to get licensed production of the British Lee-Enfield during the second Boer War, Britain said “No-Period”. The later action of opening a production site in India in 1909 and then one in Australia in 1913 only added to the bad feelings that where to come. Australia fought the order and was reasonably successful at limiting their duty to just supplying armed troops. And these troops were then horribly squandered in trying to invade Turkey. Canada however, because of its earlier dispute with Britain, had begun making its own rifle: the Ross Rifle. From day one the gun had problems, the first two models being viewed as unsuccessful. But with the advent of the completely redesigned Model 10 (ten being it came out in 1910) the gun was viewed as ready for general service. As such, the first Canadian Contingent was fully armed with Ross when it arrived in France. Their first battle was Ypres, April 1915. The stories of the various malfunctions the rifle exhibited are too numerous to say. The worst however was finding the rifle bolt embedded in the forehead of the Canadian soldier who was firing it. Canadians rearmed themselves in the field by stripping the Lee-Enfield’s and magazine belts from wounded and dead British troops. In the end, the Canadian 1st Div (20,000 men) was reduced to just 5,000 men. It was a scandal that nearly brought down the Canadian government, but it was caused by the British government policy to control arms production throughout the empire. In the end Britain couldn’t support an expansion to 5 million troops with the arms production capacity they had in the empire. Expansion of the Royal Small Arms Factory and simplifying the Lee-Enfield only produced limited results in relieving the shortage. Thus, they sent contracts to proven “American” arms manufacturers. One such contract was to build a new British rifle called the Enfield P-14. It was originally designed to use a cartridge like the German Mauser, while being easier to build. But British military commanders wanted it chambered to the British 303 round, which made the gun unreliable. At this time American was sending its 0.30-06 ammunition to Britain. The 30-06 was similar to the Mauser round and thus redesigning the Enfield to use American ammunition was successful. Production began as soon as Remington, Winchester and one other manufacturer were able. By the end of the war, these three companies had built nearly 2,200,000 examples. Did the American guns solve the British shortfall? Unfortunately, most of the rifles were never delivered to the British Army. Instead, when America entered the war in 1917 it was the US Army who was now short rifles. Springfield Armory had delivered some 800,000 M1903 rifles by 1917, but only 600,000 were actually serviceable when the US entered the conflict. Furthermore, Springfield could only produce 1,000 guns a day and its sister facility at Rock island could only do 400. Thus as the US Army expanded from 127,000 (plus 80,000 National Guard) to a staggering 4 million troops, more arms were needed. And the best option was the P-14, now labeled the M1917 rifle. The majority of American troops who fought on the Western Front were issued M1917s instead of the M1903. Please keep this in mind as this discussion continues. Other examples of guns made by American gun-makers for the Allies were 1,600,000 Russian Mosin-Nagant rifles, 300,000 Winchester Model 1895 lever-actions (also for Russia) and Vickers machineguns (by Colt). Kitchener was said to have had a low opinion of colonial troops. In reality, military experience showed that Australian and Canadian troops were better with small arms then either British volunteers or later conscripts. In the same way, American troops from rural areas tended to do better in marksmanship then East Coast counterparts. And as the trench warfare continued, sniping became a new military art. On the German side, troops from the Black Forest region were regularly killing British and French troops at extended distances. Germany issued such men rifles equipped with high quality scopes, allowing them to see enemy soldiers at distances of 1,000 yards. Initially Britain and France believed these were random successes, or just bad luck, until one of the rifles was captured. To counter them the British pressed Australian and Canadian troops as snipers. A British big game hunter then created the first sniper school in France near Calais. Back in England, the game wardens of Lords were giving instruction on shooting and camouflage to British military officers. Eventually, this would result in the creation of the British Sniper School (in Canada). In America, the problem of training conscripts in small arms had been accepted for years. In the 1916 National Defense Act the following section was passed. Sec. 113. Encouragement Of Rifle Practice. —The Secretary of War shall annually submit to Congress recommendations and estimates for the establishment and maintenance of indoor and outdoor rifle ranges, under such a comprehensive plan as will ultimately result in providing adequate facilities for rifle practice in all sections of the country. And that all ranges so established and all ranges which may have already been constructed, in whole or in part, with funds provided by Congress shall be open for use by those in any branch of the military or naval service of the United States and by all able-bodied males capable of bearing arms, under reasonable regulations to be prescribed by the controlling authorities and approved by the Secretary of War. That the President may detail capable officers and noncommissioned officers of the Regular Army and National Guard to duty at such ranges as instructors for the purpose of training the citizenry in the use of the military arm. Where rifle ranges shall have been so established and instructors assigned to duty thereat, the Secretary of War shall be authorized to provide for the issue of a reasonable number of standard military rifles and such quantities of ammunition as may be available for use in conducting such rifle practice. Eventually, the ranges were to be used to train draftees prior to them going to France. Today the program is called the Civilian Marksmanship Program. In the years immediately following the war veterans groups like the Veterans of Foreign War or the American Legion began forming rifle clubs under the shooting rules created by the National Rifle Association. The Boy Scouts, which itself was based on the concept of military scouting began target shooting classes in this time. Finally, States began purchasing surplus Springfields from the Army for marksmanship training of the Junior Reserve Officer Training Corp cadets. Regardless of these actions to stimulate rifle practice, marksmanship or even gun ownership, those communities who had previously prohibited the existence of gun ranges and ownership now began organizing to stop the Federal effort. Running in the shadow of Prohibition, by 1935 numerous guns laws had been passed at the city, county and State level in America. On the Federal level Homer S. Cummins, Attorney General for FDR was an avid supporter of gun control (which included disarming the National Guard). Additional measures were passed in Europe, Britain and the Soviet Union. The measures in Germany and the USSR were simply measures done to consolidate the dictatorships rising within those countries. The measures in France, Britain, Canada and the USA would in turn impede the fighting of one of those dictatorships. Again, Germany launched a war and the small, Professional, British army joins with the larger French army to defend the frontier. But France, who had the means to push into Germany and possibly stop the war before it truly started decided to sit within its extensive Maginot line defenses. Britain however saw that the Germans could launch a strike from Belgium as they had in the previous war. Unfortunately, the Germans had even more elaborate plans, which included cutting the British Army off against the channel and forcing them to evacuate at the port of Dunkirk. In eight days at Dunkirk the British Navy was able to rescue over 338,000 troops. But most of their heavy gear was left on the beaches: tanks, trucks, artillery representing as much as 45% of Britain’s total stockpile of such weapons. By comparison, the loss of 90,000 Lee-Enfields out of an original national stock of 1,150,000 rifles was the most insignificant loss of the event. And yet Britain had to act since, like in World War 1, a massive increase in British forces was necessary. In those days following Dunkirk, England took whatever it could get. Canada- still minus a manufacturing license- sent several thousand Ross rifles for use by the British Home Guard (they eventually served in the British Navy). Under the direction of the NRA, United States citizens donated several thousand privately owned guns. A similar nationwide search of England found some 2,000 acceptable rifles in the hands of British citizens. United States Government alone sent the following arms to Britain. Excluding the Enfield rifles, these arms represented roughly 25% of the US military reserve of arms and ammunition. 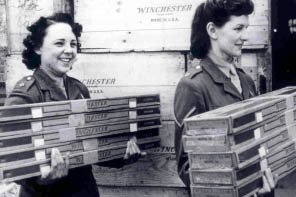 A later shipment of ammunition before 1941 brought the total to 326 million rounds: this from a military reserve of only 500 million rounds at the start of 1940. After surrendering all these arms to Great Britain America then began gearing up to produce even more arms. In this regard the FDR administration had to now undo the damage done by the 1934 National Firearm Act. This act was intended to prevent machineguns from falling into the hands of criminals, while not affecting the armed forces. Unfortunately, when Homer Cummings stated, “That the only person with a right to an automatic weapon was a law-enforcement officer” he wasn’t joking. And Cummings definition of an automatic weapon included semi-auto weaponry. As a result of Cummings, and the other gun control laws, the size of the American firearm-manufacturing base was significantly less then in World War 1. Preventing civilians from buying certain arms was one thing, but when Congress then zero funds the military budget for small arms purchases, a perfect storm was created. With no one allowed to buy certain arms, certain styles of arms cease to be built. One manufacturer who nearly ceased to exist at this time was Auto-Ordnance, the maker of the Thompson sub-machine-gun. By World War 2 it was only the owner of the patents and had no facilities to actually produce the weapon. When Britain in 1939 issued the company a contract for the weapon, the Savage Arms Company had to be sub-contracted to actual make the arms. Savage Arms in turn was then sent a lend lease contract to actual build Lee-Enfield rifles for England. Another manufacturer that one would have expected to exist, but didn't, was Browning. Today we think of Browning Arms an the Browning automatic Rifle (BAR) as the manufacturer and product. The reality was that Brownings arms were originally made by Winchester Arms for World War 1: Only 52,000 were made in World War 1, meaning the previously mentioned shipment to England after Dunkirk represented half of Americas stockpile. Further production between the wars was limited to prototype and special versions. When the second World War began it was necessary to make a company to actually build the gun (called today the New England Arms company). It was just a series of small New England gun makers who were given a BAR component to make and deliver to a final assembly site in Rhode Island. 90% of the BARs made in World War 2 (188,380) were made by this government created firm that dissolved immediately after the war. Colt Firearms, the maker of the Army M1911 Pistol, was also hurt by the gun laws prohibiting pistols (semi-auto or otherwise). But Colt was also the holder of the US Governments Browning M1917 machine-gun patents. Thus in 1940 Colt signed an agreement with Britain to build record numbers of aircraft machine-guns. Britain would not only finance the gun construction, but a massive expansion of Colt's facilities. In two years Colt acquired three new plants for the production of arms, all of which would still be hard pressed to support both Britain and, after December 1941, the US Army. These were at the Buffalo Arms Corp., High Standard Manufacturing Company, and the Kelsey-Hayes Wheel Company. Of course Colt would soon have to change its design. The original machine-gun design used cloth belts to hold the ammunition as it was fed into the weapon. At the start of the war there was only one maker for these cloth belts in the United States and said manufacturer would not allow for licensed product anywhere else. Imagine, a company so full of itself it intended to be the only maker for the ammo belts for two nations in the war (even if it meant loosing the war). Unfortunately for this company the Germans had developed a metallic link belt that performed the same function. Samples of this belt systems were captured during the initial phases of the invasion of France following which the samples were sent to America. The Army copied the design and reset it for the American cartridge. Once the American M1917 machine-guns were modified to accept this belt system the cloth belts become obsolete. The company was bankrupt by the end of the war as dozens of other metal stamping firms produced probably a billion of these metallic belt links for the War effort. For military history buffs the change from Cloth Belts to Metallic link had its greatest impact on Aircraft design. In early war fighters that used the cloth belts space in the aircraft had to be made to capture the empty cloth belt. When the machine-guns were redesigned, this space could now be used to add a second gun and the ammo tray for it. A major increase in the number of guns occurred at this time on American fighter planes. To get back to the point, the US Army in 1941 was smaller then even Britain's Army in 1939. At 175,000 it was practically insignificant to the forces being assembled around the world. Unlike World War 1 however, the US military draft began before the United States actually entered the war. Called a peacetime draft, in the summer of 1941 the Army was expanded to 1.4 million men. The problem was, after the shipment to England, there was only 1.6 million rifles in stockpile: only 350,000 were Garands, the majority being Springfields. Contracts for additional arms went hand in hand with Government appropriations of Arms previously given, or sold, to American Legion Posts, ROTC programs, etc. There is no specific record of the number of arms appropriated by the Government, but on the subject of production by war's end the United States had produced the following. If you were reading the Army only increased to 2.5 million. Thus the 12 million arms produced quite a redundancy of arms. The fact was however that originally only 1/3 of all production was to go to the US military: The rest were to go to our allies in the lend lease program. When it came to production, the United States was the place to go in that we had numerous firms willing to try their hand at making arms. After years of not producing anything during the depression, making guns was a blessing for these companies. the fact was however, even with all these manufacturers only one gun was built in quantities meeting or exceeding the need: The M1 Carbine. Even four million Garands was not enough to supply all the frontline combat troops, which again included many of our foreign allies. If it had included the State Defense Forces in the United States even the carbine probably would not have been able to fill the gap. Of course I haven't explained what State Defense Forces were. State Defense Forces came into existence during World War One with the deployment of National Guard forces overseas. Officially, SDF units allowed the States to maintain civil protection and order in the Guards' absence. 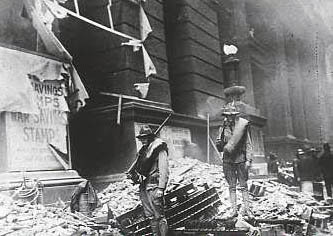 They were to perform riot control, strikebreaking when required, and help civilian agencies during natural disasters. Unofficially, State Defense Forces also maintained a military force to deal with external attacks. The fear of German U-boats landing commandos was constant during World War 1. Additionally, many of the nation's Police forces were showing political ambitions. Police groups regularly threatened to unionize and or strike. At the same time Police corruption was growing. Thus, SDF units also were ready to defend against an internal attack. The arming problem for SDF units was in relation to the suddenness of the war declaration and the Army's own arming problem in World War One. As National Guard units went overseas, the Federal government received arms requests from the States. The legal argument for these requests was Article one, section 8, subsection 16, paragraph one of the constitution. As State legislators understood it, if the federal government drafts men under this law it also must meet its obligations to arm the militia. The Federal government in World War One however was seriously short of weapons as previously noted. Additionally, there was no specific law that required the Government to arm these SDF forces. These two facts gave the government the right to ignore the requests while continuing to both draft male citizens and active National Guard Units into federal service. Thus, the States that wished to have State Troops had to purchase the arms themselves. Below is a list of how certain States equipped their SDF units during World War One. Arkansas had 60 companies, mostly vigilance committees. Of these units the State armed 18, while the rest used their own money to buy arms. Arizona used local rifle clubs as personnel for Home Guards. For legality, the local sheriff deputized the local unit commander. California had up to 100 companies. Primarily constabulary in nature, they were either self-armed or armed by local authorities. Georgia created up to 15 companies. The men provided their own clothes and on occasion their own arms. The State provided a few arms, training manuals and 600 overcoats. The Federal government provided 2,440 undelivered Lend Lease Russian Mosin-Nagant rifles. Maryland created nine infantry companies and one machine-gun company. Only the first six rifle companies were issued uniforms and armed with civil war vintage 45-70 caliber black powder Springfield Trapdoor rifles. The machine-gun company also used weapons of similar vintage: 45-70 caliber Springfields and 0.50 caliber Gatling guns. The remaining three companies were never fully armed or issued uniforms. Massachusetts created four infantry regiments, one motor corps, one cavalry troop, one ambulance company, and an emergency hospital. Armament was 10,000 rifles supplied by the State. The Massachusetts State Guard saw more use than any other SDF unit of World War One. It was first used in the flu epidemic of September 1917. It was then deployed following the Halifax disaster of 6 December 1917. Finally, in 1919 the force broke the Boston Police Strike. As you can tell most of these State militias were not uniform in arms or caliber between states. A few units did not even have uniformity of arms at the company level. Worse still the units supplied by government sources tended to have weapons so antiquated as to be dangerous to the operators. The end of the war in 1918 ended these problem by simply forcing the disbandment of most of the units. In the years between the wars the States took precautions to insure they could raise a replacement militia. Numerous arms, primarily for use in JROTC programs were acquired with the plan being that in a future emergency these arms would be used to equip the senior cadets in these programs (17 year olds). But when the second World War began, even these arms were appropriated by the Federal government. After appropriating every Springfield M1903 they could find, in December of 1941 the US government distributed the remaining World War One M1917 Enfield rifles to the States. This was a limited dole, just enough arms to equip a force half the strength of any State's National Guard Units (a policy now embedded in Federal law). [i]. The Federal government also issued 10 rounds per gun so the States had some ammunition. All total the Federal government issued 110,000 rifles to the States (California receiving 11,155). But this Federal dole was short-lived as in 1942 the Government pulled the guns back to meet its own needs. New York was allowed to keep a few rifles, while California was issued 11,000 hunting shotguns modified into World War 1 trench sweeper guns. The arms situation wouldn't change until the final years of the war when States suddenly had the government dumping old arms on them. I bring all this up because most histories only discuss the arming of regular troops. In Britain this means groups like the home guard disappear when the discussion of arms and ordnance comes up. The same can be said of the SDF forces in the United States who were actually disarmed just to find arms for those Federal troops (modern day robbing of Peter to pay Paul). And even here the arms issue doesn't end as there were SDF reserves in many States (VFW and American Legion posts) who added their armed members to the State forces. On the west coast alone there were some 90,000 armed men listed in these reserves. Immediately following the end of World War 2, the United States government began selling off surplus arms. Priority was given to our new allies- Italy, Japan, South Korea, Greece and Germany who's military had been disbanded by war's end. 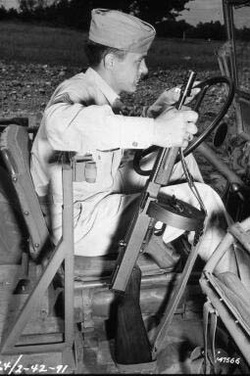 Thus when the Korean war began the Army was confronted with the need to produce additional arms while, itself, developing the new M-14 rifle. Thus Harrington & Richardson and International Harvester received the last contracts to manufacture the M1 Garand Rifle. Beretta Arms in Italy also produced a Garand copy at the request of NATO nations before they began converting to full auto weapons in the mid-1950s. The military rifle was now becoming fully automatic with 20 and 30 round magazines matching certain arms Germany developed in the later years of the war. This however meant the Army rifle was prohibited from civilian sale without violating the 1930 era machine-gun ban of Homer Cummings. For the first time in American history the civilian arm was prohibited from being equivalent to the Army rifle. But the implications of this didn't begin manifesting itself for another two decades because it wasn't until the end of the Vietnam War that the active militia (The National Guard) converted from semi-auto only arms to fully automatic weapondry. Where the Army began arming troops with the M-14 in the mid-50s, and then rearmed them with the M-16 during the 1960s, it wasn't until the end of the that war that NG units were rearmed from their World War 2 era arms. The Guard never converted to the M-14, going directly to the M-16 as the Army downsized after that conflict. As for SDF forces, many States acquired the M-14 for its JROTC programs, just as they had earlier acquired the M1903 springfield before World War 2. This use of the M-14s in SDF units went with National Guard bureau policy that SDF units were to be armed differently to Federal and Guard units. On the european side, NATO nations converted first to an arm that used the Post War 7.62 NATO round and then, in the late 60s to early 70s, began issuing arms chambered to the 5.56 round of the M-16 and used the same magazine as the M-16. The military arms of Western nations were becoming uniform, and in the same way nations supported by the Soviet Union were becoming uniform in ammunition and magazine as this nation supplied its AK-47 to any nation or group supporting the Socialist system. On the Western nation side this meant most arms production was becoming centralized with Colt Arms in the United States and Belgium's FN. By the late 70s The M-16 and the FN FAL had become the arm of most nations not with the USSR. In the process, production at these locations far exceeded that necessary to support a military draft by the United States or a few NATO nations. Taking up any slack were Beretta, Sig, Heckler & Koch, and Steyr. In short, some nations felt the need to have indigenous manufacture; either their own arm, or to have licensed production of a foreign arm. Thus they would not be cut-off from supply because of some treaty agreement, or the otherwise supplying nation cutting off exports due to their own military needs. But with the exception of Switzerland, these arms were restricted from their civilian population. Thus, given the licensed, or internal arms production would be limited to peacetime needs, if a conscription began these nations would still have to go external for arms. The result of this was that many of these smaller manufacturers/nations began making semi-auto versions of their military arms for export to- the United States. European gun control laws, as well as similar laws in Africa and South America left only America as a place to achieve sales and thus legitimize some excess arms production. In America, Police and gun controlists would not recognize what was really going on and worked to restrict the sales to only law enforcement groups. Thus American Police were preventing Americas allies from having a surge capacity to make arms incase of a sudden war or conflict. In the 1960s gun-controlists blocked Americas western allies from exporting old bolt-action and semi-auto arms to americans with the passage of the 1968 Federal Firearm Act. The arguments made were ludricrous and today's progressives in America would view some as slanderous. But the Act in turn limited the foreign arms to only semi-auto versions of the military arms they were presently making. This resulted in very public sale of these military style arms to civilians in the 1970s, a few of which ended up in the hands of criminals and radicals. Cities, who haven't had any involvement in their State's militia for 100 years, then responded with the first local laws prohibiting such arms. The situation snowballed from there to the first State prohibitions in the late 80s, and from there the Federal Assault Weapon ban in 1994. The restriction on arms implemented during the 1990s by the United States, Canada and Australia truly imbalanced the acquisition system that only barely worked for Britain and the USA in World War 2. The number of problems now imbedded in State, Local and Federal laws towards the raising of troops by a Federal government are now more numerous then one can list fully. On a United States level, the situation is as follows. First No State has the legal right or means to operate their secondary militia or State Defense Force. In the 1970s the Police had the Federal government confiscate the M-14s the States had previously acquired. Replacing these rifles for firearm training for the cadets were were single shot 0.22 caliber rifles: No mention was ever made regarding the need to arm the SDF units of these states. The States themselves were not told this occurred, leaving many States today believing they have a reserve stockpile for their SDF unit and the cadets were being regularly trained with those arms. A decade and a half later, the California State Military Reserve (the State's SDF unit) was accused by the Police of performing anti-riot training and other activities they were not authorized to do. Thus, in 1989 the force was barred from baring arms except in time of war; this is a wonderful idea since when a war starts these men would serve as the trainers for larger state force. That same year the State passed its assault weapon ban, effectively prohibiting the civil population from even serving in a militia by baring them from purchasing a proper arm. Though the State didn't realize this, if the federal government didn't supply arms and, now minus the reserve they lost in the 70s, the State couldn't arm anyone they would conscript for its reserve. As for the guns on the ban sheet, under a passage in the act, the State declared all prohibited arms as not the arms of the militia. Not a problem if the militia is armed by the State or the government with fully automatic M-16s or M-14s, but since these arms would not be forthcoming the State's blanket prohibition meant there was nothing acceptable for militia duty. To make the situation even worse, as the Clinton Administration passed a Federal ban on Assault weapons, they also ended small arm training for the JROTC cadets These last acts were prompted by gun control measures that banned guns on school campuses for the “safety of the students.” The combination of these last acts with the earlier discarding of the reserve of arms meant the State Defense Force could only operate on paper. Now in truth none of this actually endangers public safety. It only becomes a problem when you try and actually use the SDF force to protect public safety and the system then fails. This occurred in 1994 with the LA riot. One sub feature of the earlier removal of the SDF rifles was the concentration of all Cal Guard ammunition in one central armory. When the riot began it was found that the State couldn't get into the armory until the next morning: a lack of lighting prohibited the landing of a large helicopter at the armory at night and an equal lack of lighting made the road too dangerous. But one would expect that there wouldn't be enough ammunition at civilian gun stores to meet the emergency need. The problem wasn't actually a lack of ammunition, but a lack of magazines. The Assault weapon ban had effectively made military size magazines unavailable in gun stores. As for the Guard's magazines, all the ammo at the central armory was preloaded in those magazines ready for distribution. Thus even though there was ammunition available, the prohibition of the magazines delayed the deployment of the guard by 24 hours. The situation since the 1994 riot has only gotten worse. By the end of the Clinton Administration the Guard nationally was about to collapse because of an unexpected effect of the Federal ban. As men left service in the Army and then entered the Guard they were blocked from buying an AR-15 to practice with. Prior to the ban, guardsmen practiced at their own expense to maintain their competency with the arm they would be serving with. Now with the ban the new recruits would regularly fail their once a year recertification while older members, grandfathered with their now prohibited arm, would continue to pass. The result was a age heavy guard with a risk of numerous members suddenly leaving because of age. Clinton's solution, he removed the recertification requirement for a procedure that the guardsmen would be given sudden training and then the qualification test prior to going into the field. This insured that the guard could not be deployed in a time frame shorter then two months; shown when guard units were tapped in 2001 to go to Afghanistan they had to first train and then certify to bear arms before they were deployed. As the problems have mounted, the coverups have begun. One coverup was Clinton's own change in the CMP program to mandate the use of special level AR-15 rifles in its competitions. These new versions of the AR-15 are built to military specifications and use the new ammunition, and thus could be acquired for National Defense with little difficulty. In the same way, the M-1, still also used in CMP shoots, would then be available for use by SDF units. To facilitate this in California the Attorney General approved of a special muzzle brake for the M-1 to then allow it to be sold in state regardless of the Assault Weapon ban. In New Jersey the AG simply removed the AR-15 heavy barrel and the M-1 from their ban list. On an international level, Australia left itself in a serious situation. Following a mass shooting in the 1990s, the national prohibited all semi-auto and pump action weaponry. 700,000 arms which could have been used for National Defense were thus destroyed. Though only 1/4 of the nation's arms, the arms now left to Australia would never be viewed as acceptable in a crisis. As a result Australia is in no position to support Great Britain as it did in WW1 and WW2, and will have to import arms for its own defense forces. As for what will be its military arm in the future, the nation just signed to procure a large number of M-16 compatible arms from an American manufacturer who, up to now, has been under threat of being closed by State officials in Illinois since its arms were not being built for US Army troops. The Australia Army by the way is just over two divisions in size counting active reserve. Thus the number of arms destroyed was 15 times more then needed to equip the whole force. In Canada, the long gun registry produced a serious reduction in available arms that could be sent to Britain or Australia. But Canada has since removed the registry and should consider reviewing what would need to be done to prepare the nation to meet its obligations to other nations and its own people. Leaving themselves in a position similar to the Ross Rifle of World War One would result in the Canadian government being removed, including the opposition parties that supported gun control at any time in the last 100 years. And what could prompt such a need: Several possibles. Though most of the gun control acts occurred during the period when the USSR was waining and US and NATO forces were being reduced, in the last decade the rise of the new Russia has caused many NATO nations concern. The nations closest to Russia has seen the situation in the Ukraine as simply the start of future Russian expansion. As a result Poland and the Baltic nations are restarting militia training among their civilian population: training that is limited to the number of reserve arms these nations actually have. In addition to the threat of Russia, the recent influx of middle-eastern immigrants and the rise of ISIS has brought forth the concern of internal insurrection in Europe. Terrorists have done attacks in otherwise heavy gun controlled Europe, with little or no explanation as to how they got the weapons. A move by Russia on Eastern European nations previously part of the WARSAW Pact, coupled with internal fighting with Islamic militants could be too much for the present NATO nations to handle. In some ways, if Islamic forces begin fighting in Europe, a move by Russia into Europe could actually be viewed as a liberation by a majority of Europeans. On the other side of the world, the rise of China has put both Japan and Australia on notice that the long peace in that section of the world maybe over. Both nations would be hard pressed to arm and defend themselves from an aggressive China with-out the support of America manufacturing. And America is fighting amongst itself over gun ownership, while reducing its armed forces and destroying the infrastructure to support a larger force.